Defending champion Andy Murray battled to a three-set victory against Stanislas Wawrinka to reach the semi-finals of the Japan Open. The Briton beat his Swiss opponent 6-2 3-6 6-2 in two hours and one minute. The 25-year-old looked on course for an easy win against the world number 16 after effortlessly taking the opener. But Murray then lost his first set of the week before fighting back to book a meeting with Milos Raonic, who he beat on the way to his US Open title. 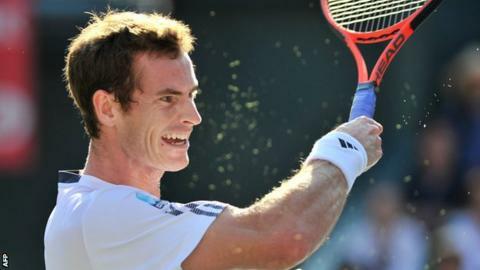 Murray, playing in his first tournament since his triumph at Flushing Meadows, had beaten Wawrinka in seven of their previous 10 encounters and looked set for another victory after breaking serve in the opening game. The top seed's progress into the last four in Tokyo was delayed in the second set as Wawrinka's inspired use of his forehand from the baseline saw him square the contest. Murray was in no mood, however, to bow out of the competition to the man he last beat en-route to Olympic gold at London 2012. In the decisive set the Scot did not face a single break point. "It was a difficult match," Murray said. "I managed to get the break in the third but there are no easy games against Stan. "We've had lots of tough matches. It was the same again today." Looking ahead to his last-four meeting with sixth seed Raonic, Murray said: "It will be a totally different match. He's obviously got a massive serve. "I played him a few weeks ago at the US Open. He's always a tricky player because of his game style." Big-serving Canadian Raonic hit 24 aces as he edged a close contest with Serbia's Janko Tipsarevic 6-7 (5-7) 6-2 7-6 (9-7). "I didn't necessarily serve my best, but I was playing really well from the baseline," said Raonic. "I'm happy to get through it. I did quite a few things well. I'm happy I played well on the big points." Asked about his defeat by Murray at the US Open, Raonic added: "He was just too good. I just have to hope he doesn't play that well again." In the other half of the draw, Czech second seed Tomas Berdych fell to a surprise 7-5 6-4 defeat against local favourite Kei Nishikori. "I just kept going for broke," said Nishikori. "I let my mind wander to winning the match in the second set but luckily I kept my focus and got the result." Victory for Nishikori means he will face a semi-final against Marcos Baghdatis of Cyprus, who beat Russian qualifier Dmitry Tursunov 6-2 6-4.